In their early years, Depeche Mode had only really attained success in the UK, Europe, and Australia - however, this changed in March 1984, when they released the single "People Are People". The song climbed to #2 in Ireland and #4 on the UK and Swiss charts - and gave them their first #1 (in Germany). However, it belatedly reached #13 on the U.S. charts in mid-1985. The song has since become an anthem for the LGBT community and is regularly played at gay establishments and gay pride festivals. Sire, the band's North American record label, released a compilation of the same name. 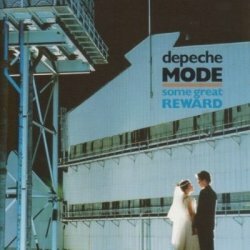 In September 1984, Some Great Reward was released. Melody Maker claimed that the album made one "sit up and take notice of what is happening here, right under your nose." Some Great Reward saw the band experimenting with even darker subject matter, exploring sexual politics ("Master and Servant"), adulterous relationships ("Lie to Me"), and arbitrary divine justice ("Blasphemous Rumours"). Also included was the first Martin Gore ballad ("Somebody") - a concept that would be repeated on all following albums, and later became the first single sung by Gore. The album was also their first to enter the U.S. album charts, and made the Top 10 in several European countries. In 1985, Mute Records released a compilation, The Singles 81>85 (Catching Up with Depeche Mode in the U.S.), which included the new hit singles : "Shake the Disease" and "It's Called a Heart". During this period, in some circles, the band became associated with the gothic subculture, which had begun in Britain in the late 70s, and was now slowly gaining popularity in the United States. There, the band's music had first gained prominence on college radio and modern rock stations such as KROQ in Los Angeles, KQAK ("The Quake") in San Francisco and WLIR on Long Island, New York, and hence, they appealed primarily to a alternative audience who were disenfranchised with the predominance of "soft rock and 'disco hell'" on the radio. This view of the band was in sharp contrast to that in Europe and the UK, despite the increasingly dark and serious tone in their songs. In Germany and other European countries, Depeche Mode were considered teen idols, and were regularly featured in euro teen magazines, providing their detractors with more ammunition to use against them.